Postmodern Jukebox Archives - Joe.My.God. Here’s a lovely break from Trump TV. 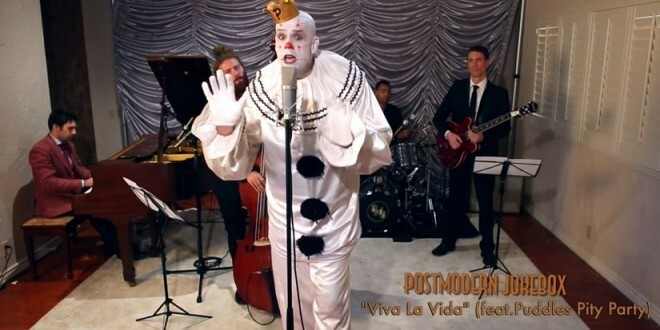 Postmodern Jukebox today posted a “Burt Backarach-style” take on New Order’s 1986 dance classic, Bizarre Love Triangle. Vocals are by acclaimed Chicago-based jazz singer Sarah Marie Young. I kept waiting for her to break into Jodi Long’s rant about reincarnation, which made New Order’s video for the track especially memorable. Watch below. Today’s Postmodern Jukebox cover is a swinging Motown-flavored take on Justin Bieber’s recent chart-topper. Lead vocals are by Broadway’s Shoshana Bean, who succeeded Idina Menzel in Wicked. The wonderfully animated backup singer on the left is Luke Edgemon, who competed on season four of The Voice. Edgemon is openly gay and also played one of the Dalton Academy Warblers on Glee. In this week’s installment the always inventive Postmodern Jukebox puts a “shagadelic” Swinging 60s spin on the Red Hot Chili Peppers, complete with Austin Powers-inspired dancers. Lots of fun. And stick around for the trombone solo from vocalist Aubrey Logan. 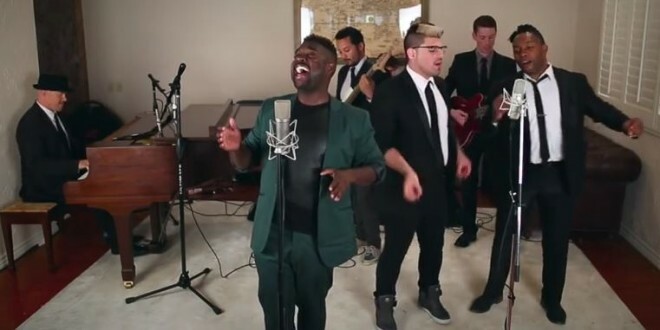 Openly gay Broadway veteran Mykal Kilgore has gone viral with his “Jackie Wilson-style” take on Celine Dion for Postmodern Jukebox. Those high notes! Kilgore has worked with Welsh popster Bright Light Bright Light and recently collaborated with Scissor Sisters member Del Marquis on his Slow Knights project. The clip has over half a million views already. I missed this when it came out a few days ago and yes, this is that Barbie Girl. The Ken doll on the left is Next Magazine cover boy Joey Khoury, whom you might have seen in the long-running Off Broadway hit Altar Boyz. Stick around for the “human theremin” bit. With an adorable tap-dancer. And whistling! A 70s soul take on the 1999 Backstreet Boys smash. Featuring Broadway’s Shoshana Bean, who seems to be everywhere these days. 300K views on the first day. With a cute bearded tap dancer! UPDATE: The dancer is Alex MacDonald, who is a teaching artist with the Alvin Ailey Dance Foundation. See more of him here. “Miche Braden (from our “Sweet Child O’ Mine” cover) was in town, so she stopped by to lend her legendary powerful voice to this Bon Jovi ’80s classic. Also, check out the horns playing the Richie Sambora guitar solo. This one takes me back to my New Jersey roots.” You remember that cover, right? Postmodern Jukebox is posting “slow jam” versions of popular cartoon themes. Last week they did the Pokemon theme. The vocalist really kicks it out here. Featuring gay jazz star Dave Koz. With gay nine-time Grammy nominee Dave Koz on sax.